The hellish scene that decorates the Venomous Demon Skull Dagger makes it a fascinating piece to add your collection. Snakes, skulls, and horned demons contribute to a theme that bespeaks divine punishment via fire and brimstone. The stainless steel blade follows the basic shape of a trailing point. 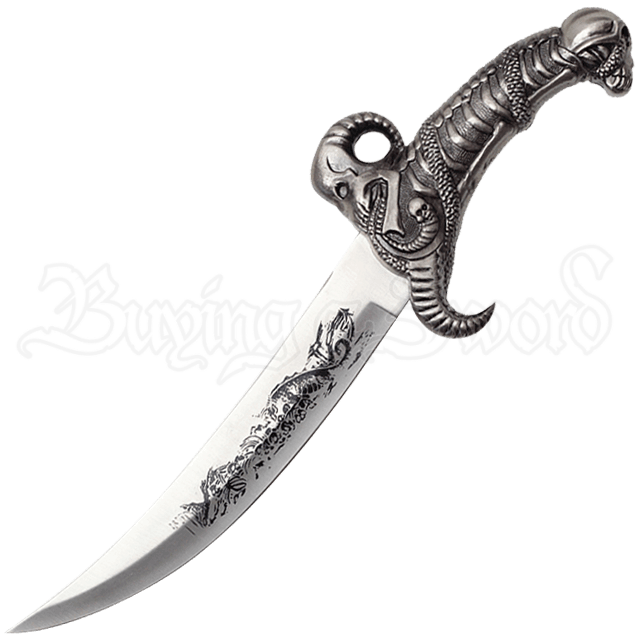 The dark engravings found on its polished surface echo the dark theme of the hilt and scabbard. A skull with twisted vertebrae forms the guard of the handle. A deadly snake weaves its way through the rib cage that decorates the grip. Another skull defines the pommel. More skulls and a horned demon appear in the cast metal accents of the scabbard. A faux wooden finish covers the acrylic center of the sheath.